Oil on panel, 29,5 x 19,5 cm. 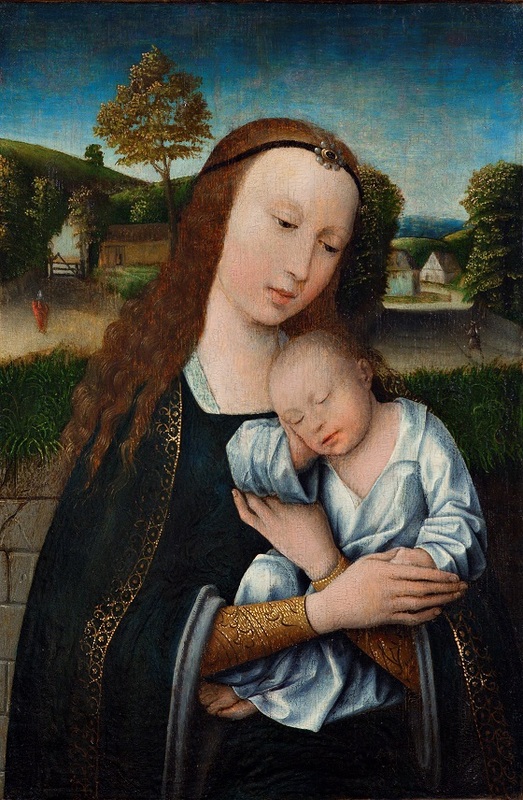 A blessed Virgin Mary holds the sleeping Christ Child safely in her arms. Her head is turned slightly downwards, and she is wearing a black band over her forehead with a piece of pearl jewellery. A stone wall separates the two of them from an idyllic landscape in the background. Behind the wall, a woman is walking along a path towards a small village nestled between high hills and under a clear blue sky. The Holy Family therefore appears side by side with the profane reality that the artist is also a part of. What makes this painting very unusual is that the Christ Child is not depicted naked, but instead wearing a white shirt; a reference to his burial shroud. This distinguishes the scene from other Dutch Madonna paintings from the 16th Century.